It’s hard to imagine the industrial town of Bonnybridge near Falkirk as a portal to another dimension but the everyday hustle and bustle of the area hides a more mysterious and sinister background. Nicknamed the ‘UFO capital of Scotland’, Bonnybridge is a hotspot for extra-terrestrial activity and people from around the world have come to the town to gaze at the skies above. Some reports state there are over 300 UFO sightings a year in the town alone. 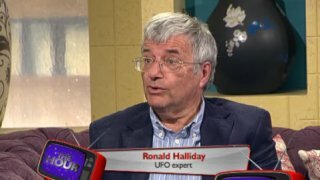 UFO expert and author of 'Beyond the Falkirk Triangle,' Ronald Halliday believes that Scotland’s twilight zone isn’t just restricted to the Falkirk area and there are strange lights to be seen all over the country. Is there something strange going on in Scotland’s skies? Speaking to The Hour Ronald said: “People do have close up encounters and people do claim to have seen things that are very hard to explain right away. “There have been thousands of reported sightings in Scotland and in fact the country has been labeled the UFO capital of the world. There has even been some suggestion that Scotland acts as a window into another dimension. The release of previously confidential MOD files by the National Archive in 2008 unraveled further suspicions of potential unidentified objects in Scotland’s skies. From 1940 onwards various eyewitness accounts have included everything from mysterious beams of light in Lennoxtown to an alleged abduction in Livingston. Despite its reputation as a hotspot for alien activity, Ronald insists that it has never been more important to validate potential sightings and check for signs of false or natural explanations. “I think we have got to be critical about the whole thing. You can’t accept every claim that someone has seen something strange unless there is real evidence; you have to evaluate it and take a look to see if we can explain it through science or natural phenomenon. However, one would be advised to keep your eyes on the Scottish skies for now. As the use of camera-phones and handheld recording equipment grows, so too does the chance of spotting a UFO - just make sure to wear a warm jacket.